I am sure you are thinking, “So, what is the problem.” Well, the problem is found in Genesis 11:31. Did Terah receive a call from God also? Is there a discrepancy in God’s word? Which historical account is accurate? Before we answer these questions, let’s examine a few more passages. Maybe they can help shed some light on this apparent contradiction. Not only do these scriptures not help in solving the problem, they even introduce another problem. 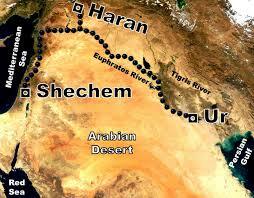 Joshua plainly states that Terah and other of Abraham’s kindred served other gods while living in Ur of the Chaldees. However, Laban implies that the “God of Abraham” was also the “God of their father (Terah)”. Do not despair. I believe that we can solve this apparent dilemma. When interpreting any passage of scripture, we must consider the context. The historical and cultural context is very important in trying to understand the passages before us. Let’s try and decipher this latest problem just introduced to us. Simply put, both Joshua and Laban are correct. It is true that Terah served other gods. It is also true that his God was the same as the God of Abraham, that is, Jehovah. How can that be? Remember that the God of the Israelites was Jehovah and, yet, oftentimes they served other gods. So it was with Terah. Terah was the ninth generation after the flood. Eber (Heber) was the fourth generation. It is from Heber where the word Hebrew is derived. In fact, his name means, “on the other side.” Most probably, Heber settled in Ur after the confusion of languages in Babel. He was still alive even during the time of Abraham. I am sure that he passed on to his descendants the story about the true God. Well, let’s now address the first issue that was presented. Who received the call…Abraham or Terah…maybe both? This was the time of the patriarchs. The father of a family was the patriarch of that family. It was to him that final decisions rested. I believe that just as the Bible states, Abraham received a vision or call from God while he was still living in Ur. Being the dutiful son that he was, I believe he went to his father and told him about his vision. Although Terah served idols, he still retained the knowledge of the true God. The stories that Heber no doubt related to him about Jehovah probably became alive. He knew that Abraham had indeed heard from the true God. As a result, he led his clan out of Ur to go to the land of Canaan. He made it as far as Harran (Charran), when his health probably failed him and he died there. No, there is no discrepancy in God’s word.